This book provides a practical guide to analysis of simple and complex method comparison data, using Stata, SAS and R. It takes the classical Limits of Agreement as a starting point, and presents it in a proper statistical framework. The model serves as a reference for reporting sources of variation and for providing conversion equations and plots between methods for practical use, including prediction uncertainty. Presents a modeling framework for analysis of data and reporting of results from comparing measurements from different clinical centers and/or different methods. Provides the practical tools for analyzing method comparison studies along with guidance on what to report and how to plan comparison studies and advice on appropriate software. Illustrated throughout with computer examples in R.
Supported by a supplementary website hosting an R-package that performs the major part of the analyses needed in the area. Examples in SAS and Stata for the most common situations are also provided. Written by an acknowledged expert on the subject, with a long standing experience as a biostatistician in a clinical environment and a track record of delivering training on the subject. 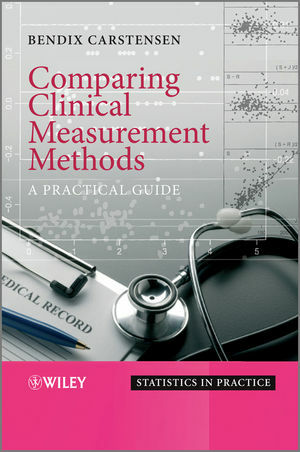 Biostatisticians, clinicians, medical researchers and practitioners involved in research and analysis of measurement methods and laboratory investigations will benefit from this book. Students of statistics, biostatistics, and the chemical sciences will also find this book useful. Bendix Carstensen has been working as a biostatistician in research institutions since 1983. During the last 10 years he has taught courses for medical PhD-students at the Department of Biostatistics at the University of Copenhagen and has been involved in the delivery of overseas courses in epidemiology and the comparison of measurement methods. 2.1 One measurement by each method. 2.1.1 Prediction of one method from another. 2.1.2 Why not use the correlation? 2.1.3 A new method and a reference method. 2.2 Replicate measurements by each method. 2.2.1 Exchangeable replicates: fat data. 2.2.2 Linked replicates: oximetry data. 2.2.3 Why not use the averages of the replicates? 2.3 More than two methods. 2.5 What it is all about. 3.2.2 Comparing with a gold standard. 3.3 More than two methods. 4 Two methods with a single measurement on each. 4.1 Model for limits of agreement. 4.1.2 The correlation of the difference and the average. 4.2 Non-constant difference between methods. 4.4 What really goes on. 4.5 Other regression methods for non-constant bias. 4.5.1 Why ordinary regression fails. 4.6 Comparison with a gold standard. 5.1 Pairing of replicate measurements. 5.3 Models for replicate measurements. 5.4 Interpretation of the random effects. 5.6 Getting it wrong and getting it almost right. 6 Several methods of measurement. 6.3 Single measurement by each method. 7 A general model for method comparisons. 7.2 Interpretation of the random effects. 7.3 Parametrization of the mean. 7.4.2 Plotting predictions between methods. 7.4.4 Comparison with a gold standard. 7.6 Models with non-constant variance. 7.6.1 Linear dependence of residual standard error. 9 Repeatability, reproducibility and coefficient of variation. 9.3.1 Symmetric interval on the log scale. 9.3.2 Computing the CV correctly. 10 Measures of association and agreement. 11 Design of method comparison studies. 12 Examples using standard software. 13 The MethComp package for R.